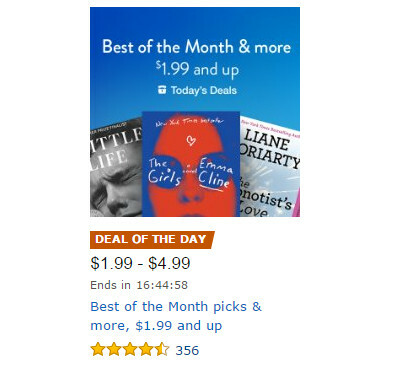 Every couple of weeks lately Amazon seems to have a sale on Kindle books for one of their main deals of the day. This time around the ebook sales include select “Best of the Month” picks. There are some additional Summer Reading Deals at up to 80% off as well. In other deal news, the Fire HD 10 is on sale again too. It’s marked down by $50, starting at $179 for the 16GB model. I still think the Lenovo Tab2 10 is a much better tablet for the price. It’s a bit cheaper too. Amazon has the Fire HD 6 “on sale” as well for $69, but it’s always at that price lately so it’s not really a sale. Same with the older Fire HD kids tablets—they are on perma-sale too for $30-$50 off. Nathan, I doubt any of us take for granted the incredible amount of work you put into this blog, but I wanted, personally, to express my great thanks to you. You’re welcome, Brooks. Read on!